Power plants are a major source of greenhouse gases. Photo courtesy of NOAA. Saturday, December 5, 2015, marked the midpoint of the UN-sponsored climate change conference in Paris (COP21). Some have claimed this conference is humanity’s last chance to stem the rise of worldwide temperatures short of levels that would lead to catastrophic changes in the weather. Saturday was also the day that a mandated proposed draft was released, so some of the parameters of the final agreement have become less fuzzy, though far from altogether clear. The conference began on November 30 with optimistic-sounding rhetoric from world leaders. A cynic would say it seemed the temperature in Paris was rising from all the hot air, but at least the heads of state set a positive tone. At the same time, there were much publicized meetings and greetings: The presidents of Israel and the Palestinians shook hands for the first time in five years; The presidents of Turkey and Russia met to discuss the recent shooting down of a Russian plane; And of course everyone was discussing how to confront ISIS. Our cynic might say that to some world leaders the conference was simply what a round of golf is to businessmen — a convenient occasion on which to make deals unrelated to the underlying activity. Nevertheless, the atmosphere — no pun intended — is much changed from past COPs, at which little or no progress was made. This time, with worldwide temperatures and atmospheric carbon dioxide levels soaring to new highs, a sense of urgency pervades the proceedings. 2015 is on pace to be the hottest year ever for global land and sea temperature — and it isn’t even close. The increase from pre-industrial time is already one degree Celsius — half the rise considered to be acceptable in the long run. And the rate of rise is increasing. If the temperature increase for the last two years is extrapolated out a century, humanity will be deep-fried by 2100. At the start of the industrial revolution, atmospheric CO2 was 280 parts per million (ppm). The most recent readings on Mount Mauna Loa in Hawaii show the CO2 concentration over 400 ppm. Again, the rate of increase is itself increasing. The conclusion seems inescapable that greenhouse gas emissions, particularly CO2, are responsible for the warming of the land and sea, and are a significant danger to civilization. 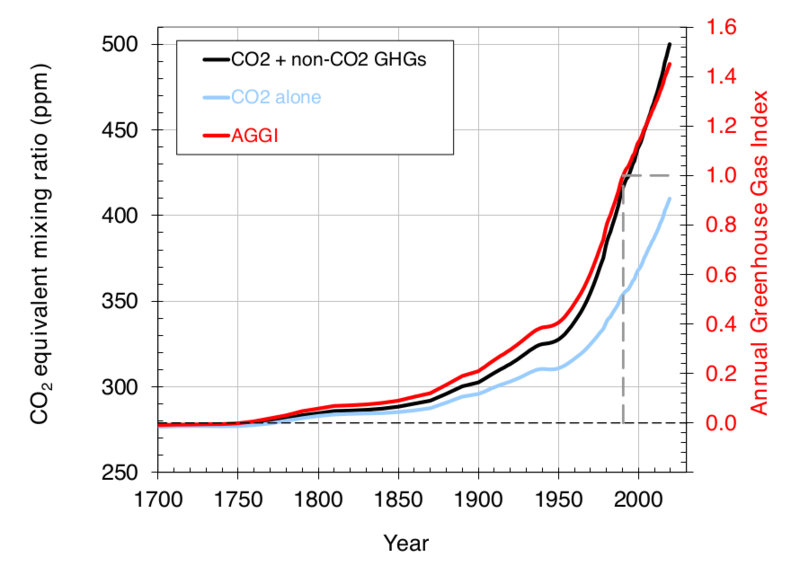 Atmospheric greenhouse gases are increasing. The rate of increase is also increasing. Graphic courtesy of NOAA. Speechifying over and leaders having departed, the heavy lifting has been done by technical and political negotiators from the 195 countries, each with a different agenda, and all of whom have to sign the final agreement. At times it seems there are so many lines in the sand that no compromise is possible. Negotiations may yet drown in a sea of geopolitical tensions. Nevertheless, progress has been reported and is evident in the draft. A pathway seems available to an agreement that, though the route may be tortuous and the end result may not quite meet the requirement of containing global warming to the magic two degrees Celsius, at least shows that a start has been made and a reasonable temperature-rise-containment goal can be reached. Developing nations want to acquire those lifestyles. To bridge the gap between these attitudes, the conferees agree that the developed world must contribute to the cost of limiting the use by developing nations of fossil fuels, substituting green energy instead. The question is who should pay whom – and how much. What’s In The Draft Agreement? This sounds nice. But will it ever result in significant implementation of serious emission-reducing action? This issue prompted the poorer nations to walk out of COP19. The US and EU are adamantly opposed to any binding legal mechanism to mandate compensation for the effects of global warming, fearing a slippery slope at the bottom of which they will be held responsible for massive amounts of compensation. It will require careful word-crafting to satisfy all parties on this issue. The minister is vaguely hopeful — very vaguely. The door will be left open, but will anyone pass through? What could possibly be a successful method of enforcing compliance? It is hard to imagine an international army marching into a country to dismantle a coal-fired power plant. What Is The Next Step Towards The Final Agreement? Now the agreement will be parsed at the ministerial level. With representatives of major polluting industries buzzing around, there is the possibility of much mischief. The final agreement will be in doubt until the last i is dotted. Global air and sea temperatures have been rising since the start of the industrial revolution. Recently there has been an upward spike. Graphic courtesy of NOAA. Let me take a stab at predicting the outcome of COP21, just as a benchmark against which to judge the success or failure of the conference’s final agreement. There will be a legally binding, but weak, part of the agreement. There will be a voluntary part of the agreement. The emphasis of the final communication will focus on the fact that a binding legal agreement was reached, and that the binding emissions reductions combined with the voluntary ones could create a best-case scenario that will limit warming to the two degree C goal. Our cynic will say the can has been kicked once again; but this will be a gentler tap, with the possibility that the combined efforts of the world’s countries, developed and developing, might actually pick up the can before it rolls over the edge of the cliff. To an individual looking at the vastness of the sky, it appears as though the atmosphere is endless. But what does it look like from a different perspective — from outside the confines of the earth? The solar system is very big. The fraction of it occupied by the thin atmospheric covering of Earth, the only place hospitable to intelligent life, is tiny. Graphic courtesy of NASA. The volume of the earth is about 268 billion cubic miles (A sphere with a radius of 4,000 miles). Assuming the atmosphere is 100 miles high (a generous estimate; outer space is generally considered to begin at 62 miles), the volume of the earth plus atmosphere is about 288 billion cubic miles (A sphere with a radius of 4,100 miles). Therefore, the volume of the atmosphere is about 20 billion cubic miles. Assuming the solar system extends to Pluto (It actually goes much farther), the volume of the solar system is about 500,000,000,000,000,000,000,000,000,000 cubic miles (A sphere with a radius of five billion miles). Using these generous values, Earth’s atmosphere comprises less than one billionth of one billionth of one billionth of the volume of the solar system. The volume of our galaxy is vastly more than the volume of the solar system and the volume of the universe is vastly greater than the volume of our galaxy. To express the fraction of the universe that our atmosphere occupies, I would have to type billionth about a billion times. The Parties to the Paris Convention should ask themselves: Do we really want to screw up this one exceedingly tiny corner of the cosmos that is the only place known to be hospitable to intelligent life? If the race against global warming was a football game, it would be the fourth quarter with time running out and our team three points behind. Barring a successful Hail Mary pass, a touchdown is out of reach. But gaining enough yardage to kick a field goal which would send the game into overtime and give us a chance to win is still a possibility. Hopefully the results of COP21 will move the ball down the field.